Knowing that you love sweets, I thought this would be the best post for today! For all of you, here’s the very easy soft and spongy Rasgulla (one of the very famous Indian sweets made from ball shaped dumplings of chhena/moist farmers cheese or cottage cheese, cooked in light syrup made of sugar) recipe. You are surely going to relish it just like we did. Boil milk in a large pot. Keep stirring with spatula at intervals. Get a large bowl and put a colander on it.Now get a muslin cloth or soft kitchen napkin and put on a colander. Put the chhena (moist farmers cheese or cottage cheese) and water mix on it. Water will start draining. Hold the cloth tight and drain some more water. Now hang the cloth with chenna on your tap and let more water to drain gradually. Leave it there for atleast 30 minutes. Bring the chhena out from the cloth into a plate. Knead it for 2-3 minutes till it becomes smooth. Now make 8-10 balls out of the chhena. Keep aside. In a pressure cooker, add water and sugar and bring to boil. When the water starts bubbling, add the balls one by one. Cover the pressure cooker with a lid (don’t close the lid just cover with it – we don’t have to pressure cook) for 15 minutes. Boil on high flame for first 5 minutes. Then on medium-high flame for the remaining 10 minutes. Close the flame. Transfer the Rasgullas with some sugar syrup into a bowl. (Be careful while transferring to ensure that they don’t break). Let it rest for 6-7 hours before serving. 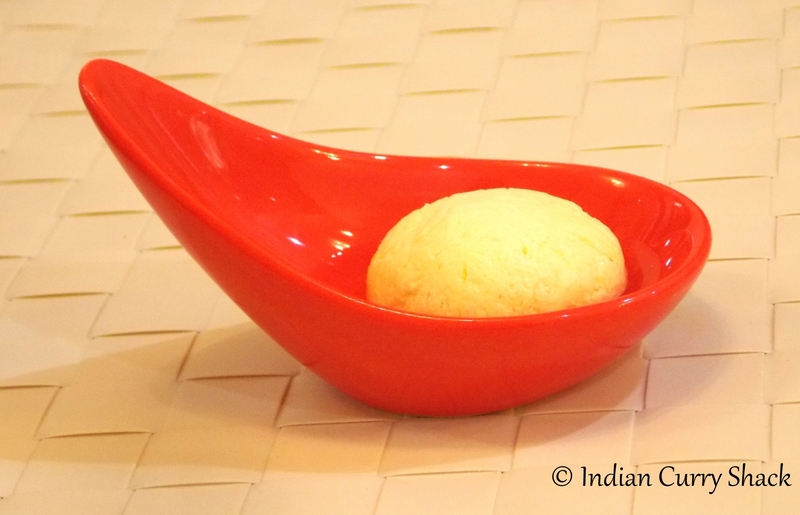 Enjoy your delicious and spongy Rasgullas. Damn delicious fresh cheese dessert!!! They actually were. 🙂 Thanks so much!